Simon & Schuster Books for Young Readers, 9781416940227, 416pp. Eleven year old Sophie Turner lives in Manhattan and attends an all-girls private school, but some difficult changes have left her feeling very lonely. When Sophie's best friend, Jessie, suddenly rejects her for a faster crowd and the Turner family begins to break down, Sophie's only source of comfort is the distant voice of her school-assigned pen pal, Katie. Eleven year old Katie Franklin lives in California, and she thinks life is perfect. When she and her best friend, Jake, spearhead a charity project for earthquake victims in Mexico, Katie couldn't be happier. But when Jake starts paying attention to another girl, Katie get jealous, and does some things she isn't proud of at all. 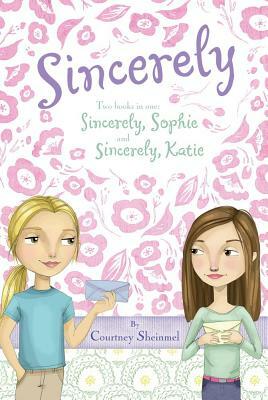 No one at home understands her, but she does have one friend she can open up to--her pen pal, Sophie. Two realistic, gentle novels in one about dealing with transitions and divorce, friendship and jealousy, Sincerely looks at the enduring power of friendship--even from miles away. Courtney Sheinmel is the author of All the Things You Are, Sincerely, Positively, and My So-Called Family. She graduated with honors from Barnard College, part of Columbia University, and attended Fordham University School of Law. Courtney lives, works, and writes in New York City. Visit her at www.courtneysheinmel.com.